Ten years ago one of my heroes, Kim Yale, was taken from this world by breast cancer. I was lucky enough to have called her friend, and her courage and sensibility guide me to this day. Last year Bill-Dale Marcinko, my closest buddy from college who taught me so much about how and at what to laugh at, passed away in a house fire. So much of what I am today I also owe to Billy. Now my best friend in the world, Sondra Leah Fogelson Adezio, has gone to a place where I cannot yet follow. And I am bereft another hero, another mentor, and another very large piece of my heart. I met Leah about 15 years ago at a comic book convention in New York. It might have been at the Javits Center, I distinctly remember hanging out with her around the steps that led down to the exhibition hall and gabbing about anything and everything. It hadn't been that long since her mom had died from cancer, and she'd decided to embrace an artistic career with the support of her husband David and two young sons Stephen and Daniel. She'd done a bit of professional inking but was also working on her own concepts to write and pencil. 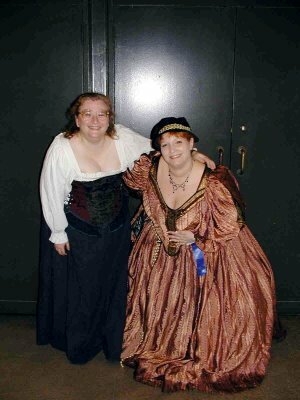 In those days another woman at a comic con, particularly someone around my age, was still an anomaly and we bonded immediately. Over the years we saw each other as often as we could, what with me living in Brooklyn and her in Newton, NJ. We journeyed to conventions together (I've often joked to Robin that he's not the only inker with whom I've shared a bed), attended Friends of Lulu NY meetings which I hosted in the loft of my old office, and talked on the phone as frequently as though we were still in high school (having not known each other back then we had a lot of catching up to do). Leah and I worked together on three scripts for her pet project, a 6-issue series called Ari of Lemuria about a teenager and her best friend (who just happened to be a prince) and their adventures in their undersea kingdom. Writing with her was one of the highlights and joys of my life, and it was always an occasion when she'd come over for a session. She spent months shopping around her detailed outline looking for a publisher and, after finding one, was crushed when they requested she cede the actual art chores to Anne Timmons and Trina Robbins. Which might not have been so bad (after all, those two ladies went on to work together on the wonderful GoGirl series) except that the publisher also turned out to be one of those shady "contracts were made to be broken" outfits from which we never saw a penny for the scripts. The only bit of Ari that ever got published was a four-page story (which we both wrote, she drew, and I lettered) that appeared in the Friends of Lulu Storytime anthology. When she and David and the kids moved to suburban PA and she concentrated on being the family breadwinner due to his epilepsy-related disability leave, that kind of put paid to further collaborations, but even after Robin and I moved to the Bronx we still got together as much as was possible (more often than you'd think, but then "Leadfoot Lass" rather enjoyed making the long drives). After David passed away a little over 3 years ago, Leah never regained her desire to create comics, although she still read them passionately for the rest of her life. Leah prided herself on being the Cool Mom, always taking interest in Stephen's and Daniel's hobbies, encouraging them without indulging or pushing, showing by example all the wonderful pop-culture avenues available to them. And her sons have grown into kind and intelligent young men of whom any parent would be proud. She latched onto manga long before I did (but on the other hand I was responsible for her first taste of sushi), exhibiting a particular fondness for Pikachu and other cutesy stuff. (One of her last great passions was for Happy Bunny.) 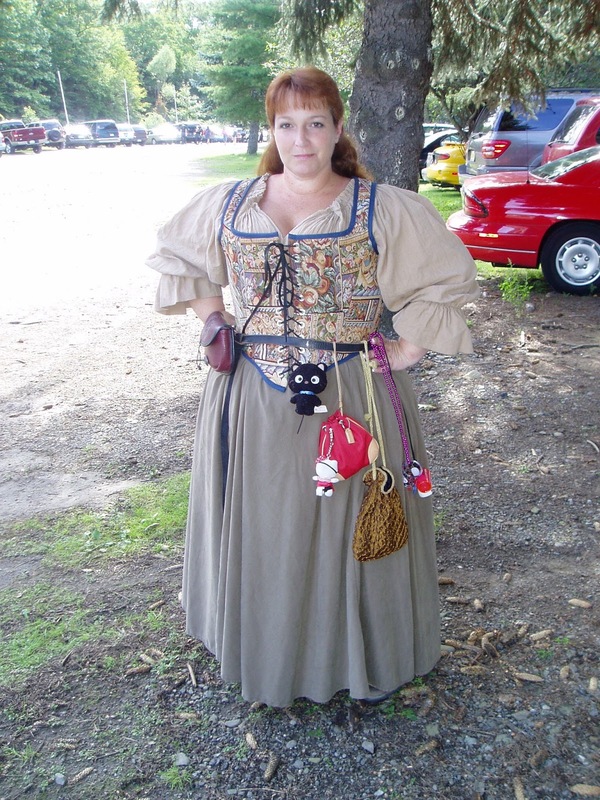 For the last half dozen years she was a regular at area Renaissance Faires, always garbed and in on all the private jokes among faire workers. Robin and I attended the NY festival around September 11 every year to celebrate her birthday (she really resented that the date became so infamous that she felt guilty celebrating it); needless to say, we don't plan on ever going to any more faires. Leah loved cats, and liked to name hers after various bits of Aquaman lore. She was near inconsolable when Kako died, but Tempest and Atlanna and the twins Mera and Maleika are all still around and purring. She loved to bake bread from scratch, when she could find the time, and to make miso soup. She loved singing along with the car radio, sometimes even in tune (I kid; she had a lovely trained voice), and she adored the late Harry Chapin. She loved Star Trek, which reminded her both of David and of her late brother Scott, cut down by a bullet in his prime. She had an appetite for all sorts of fun, and delighted in bawdy humor. She loved the New York Mets, and loved to relate the story of her dad having arranged for her to meet Rusty Staub (for whom her younger son is named) for her 16th birthday. And yes, she had her own sense of time. During the years I was dependent on her for transportation I learned to wait and to not make too many clock-related plans. And yes, she had a tendency to neglect her fiscal and physical health in favor of pursuing her bliss. But in the end that's what it was all about anyway, living her life as fully as it could be lived despite all the tragedies life threw at her, and it was her nature to give herself fully to her passions as well as to her family and friends. And yes, she loved her cigarettes a bit too much, but few of her health problems (with her liver and other body betrayals) were due to that or to her weight; she never seemed uncomfortable being a fat woman, and was always impeccably made up and carried herself as the beautiful creature she knew she was. 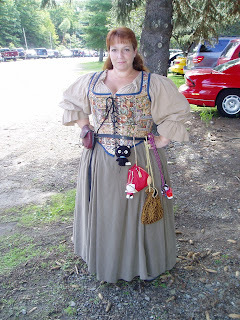 She tried to instill some kind of fashion sense in me but, other than coloring my hair and getting me into garb a couple of times, it never took. Still, her generosity insured I would never lack for hand-me-down dresses in my closet from my sister of the heart. To say my best friend will be greatly missed is to insult her memory with understatement. Leah will be present in everything I ever do for the rest of my life. She will live on not only in her sons but in all the people whose lives she deeply touched, none of whom has ever had a bad thing to say about her. I am privileged to have known her and to have been a part of her life, and I will always cherish the gift of herself that she left me. Rest in peace, my special friend, together with your beloved David once more. Obit on Wench board linked in post below. Mera and Malaika are still alive. They never were twins, just littermates. They dislike each other and never interact. Mera is a very overweight neurotic girl who loves Sam, and Sam alone. Malaika is a sweet girl who loves everyone. I wish they hadn't been declawed.